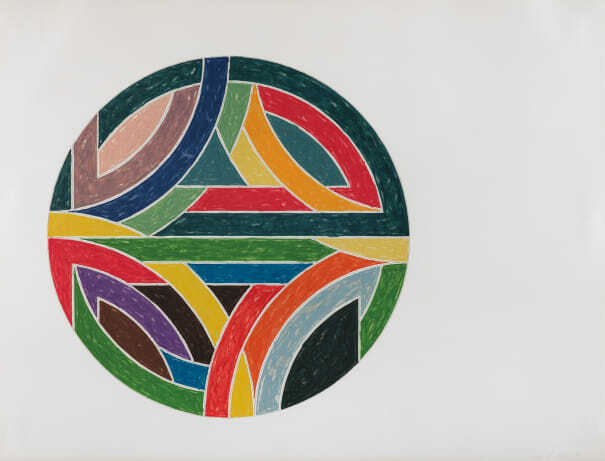 One of the most important living artists, Frank Stella is recognized as the most significant painter that transitioned from Abstract Expressionism to Minimalism. He believes that the painting should be the central object of interest rather than represenative of some subject outside of the work. Stella experimented with relief and created sculptural pieces with prominent properties of collage included. Rejecting the normalities of Minimalism, the artist transformed his style in a way that inspired those who had lost hope for the practice. Stella lives in Malden, Massachusetts and is based in New York and Rock Tavern, New York. Offset lithograph and screenprint in colors, on Arches Cover paper, with full margins. Signed, dated and numbered 21/100 in pencil (there were also 20 artist's proofs), published by Petersburg Press, New York, framed.